On Wednesday 14 February, Te Toki a Rata (TTR), Victoria’s new pride and joy, was officially opened. This building (all $100 million of it) provides some 12,500m2 of new scientific teaching, research, and open-office space. Don’t get me wrong, the citrus-orange floors and sauna-esc stairwells of the New Kirk building facilitated countless passing discussions that I will always cherish, but TTR is exactly what the School of Biological Sciences (SBS) needed. Wednesday saw a flock of academics, postgraduate students and professional staff leave the safety of their desks and flood the main foyer. Free drinks and fancy finger-food in hand, we—supposedly ‘social primates’—occupied ourselves with awkward small-talk and over-the-top laughter whilst anxiously awaiting the arrival of The Right Honourable Jacinda Ardern (if free food and drinks wasn’t enough to entice even the most introverted scientist, a chance for a Valentine’s Day selfie with the PM certainly sufficed). Self-deprecating jokes aside, Jacinda gave an impressive mihi and opening speech to follow. I’m certainly not a fan of New Zealand politics (or any politics for that matter), however, Jacinda gave off an impression that few political leaders do: authenticity. With the formalities over, Jacinda made her way around the foyer for some obligatory meet ‘n’ greet. 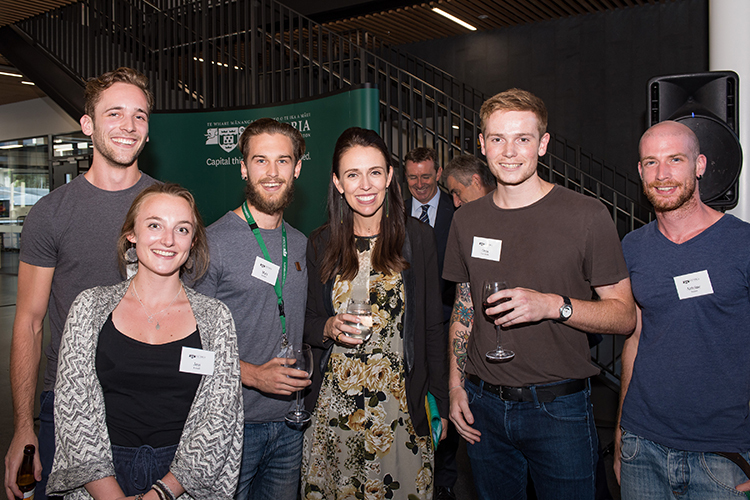 But unlike the usual forced smiles, shaking hands, and kissing babies one might expect, Jacinda took a genuine interest in the work of school members. After tentatively snaking our way into the general vicinity (and perhaps gaining a little too much attention from her security staff), we were fortunate enough to get some one-on-one time with the PM. Going around the circle, we introduced ourselves and what we do here at the school. “I study how life evolves on islands”, I said nervously. Instead of the cool-story-bro look I’m more accustomed to getting when I explain my research to someone, I was met by a face of equal parts shock and curiosity. “That’s intriguing! Tell me more.” At this point, I wasn’t quite sure how to continue. At these kinds of events, I expect few people to take an interest beyond the first sentence of my work, certainly not the PM. We chatted for a while longer before Jacinda finished with some more mingling and a photo with one of Victoria’s resident Tuatara, ‘Spike’. Overall, the opening of TTR was nothing short of empowering. I’m sure plenty of SBS post-grads will be milking the move to TTR, and how it has affected their research, for all its worth (as any good student with a deadline would). But this building has already acted as a catalyst in Victoria’s scientific research. The open offices are modern and collaborative. The lab spaces are larger and more advanced. The teaching areas are group-based and discussion-oriented. All of this, together with the a few resident reptiles, makes for what I’m sure will be an exciting future for students and staff alike. Matt Biddick is a PhD candidate in the School of Biological Sciences.